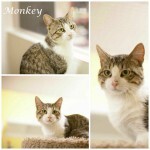 Monkey's owner could no longer care for. He was part of a household of 21 cats and was being picked on. 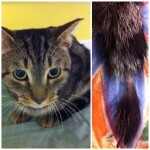 He was Neutered along with all of the other cats in the household and all have been adopted! 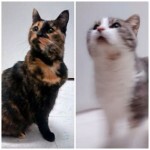 Peaches and Panda are 2 more from the Marble Point colony of 38 cats that FFL rescued. Shy at first we were able to evaluate over a few weeks. 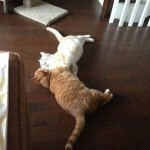 They were found to be a bonded pair and were adopted together. Shown here in their new home. This is why we make a huge effort to keep bonded families together! Peaches and Panda are 2 more from the Marble Point colony. Both were very shy when brought in from the colony of 38 cats but after a couple of weeks they turned out to be very friendly. 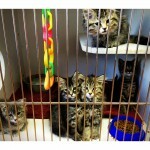 They were Spayed and Neutered and have now been adopted together! Louey came to us by way of an individual in Foxboro. It was during the extreme temperatures we experienced that he was found crying outside. He had taken to finding warmth by curling up in a recycling bin. As a result the top half of his tail was frost bitten. 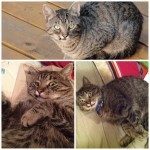 He was neutered and vaccinated and has now been adopted! Suzanna was rescued from outdoors where she was found trying to defend her 5 babies. 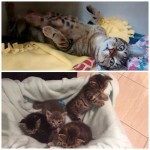 They went into foster care with Fixed Fur Life . Mom was Spayed and she was adopted. All babies have now been adopted too. 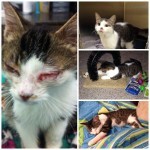 Update on Aidan kitty who came to FFL and spent many weeks with us getting over a severe eye infection. 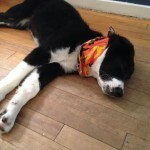 Shown here recovered and we received these new pics of him in his new home. Sarge lived many winters outside. He sustained a mouth injury which has left him with a mouth defect. He was finally rescued neutered and is shown her in his new home. We were successful with working on a cat colony on Hamilton Road. In total we managed to get get 10 kittens. All had fleas, worms, eye infections and lice. They range in age from 4 weeks to 6 months. The older ones were spayed and neutered. All have now been adopted! Penny and Suzie are not biological sisters but sisters at heart. Penny came to us as a stray. The person who brought her in witnessed a man hit her in the head with a shovel and as a resul she had an injured ear. Suzie the torte had always been a loner until she met Penny. The 2 have now been adopted together. 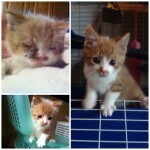 Ringo came to Fixed Fur Life as a wee litten of 3 weeks. He had a severe upper respiratory infection and we spent many weeks getting him back on his feet. He has had a full recovery and has now been adopted! 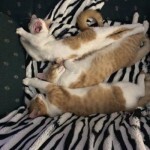 The 3 Amigos adopted together as wee kittens shown here in their new home many months later. Update received that they are doing really well and are as always inseparable! So Glad we adopted all together! 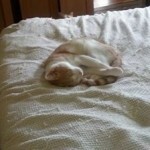 Goldie was advertised on a "Free to a good home" ad on Kijiji and the new owner was unable to keep. She was rescued by FFL and Spayed through FFL. Shown here in her new home with her new little friend Gertie.!! " Lilly taken in as a pregnant stray delivered her kittens a few days later on 23 April 2014. 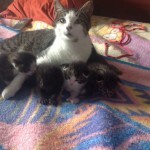 She has weaned her kittens who are now available at Paws Active Doggie Daycare & Grooming. 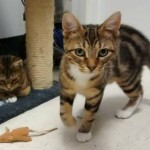 She has been Spayed and has now been adopted! My mom and dad were not fixed and i was born. 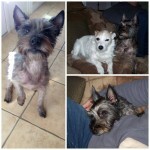 My owner was unable to look after us so we were surrendered to Fixed Fur Life. I was Neutered and adopted. Shown here in my new home! My owner moved. She packed up her kids, her furniture but not me. She left me to become a stray. She stepped over me in the driveway and drove away. I stayed on the back step for days on end waiting for her to come back. It has been 2 weeks and the neighbours have been feeding me. Fixed Fur Life came to get me. They took me to the vet and had me neutered and vaccinated. I have now been adopted by responsible loving people. The Gang has been Adopted! These little ones were born outside. 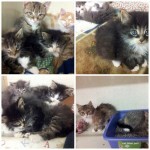 They were all weaned and have now been adopted. Momma was Spayed as well! 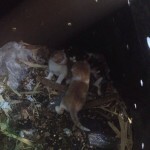 These little ones were born in a compost bin. Brought to FFL they were nursed and have all been weaned and gone on to their new homes. Mom will be Spayed. Orchid,Tulip and Bean were taken in as a young strays. 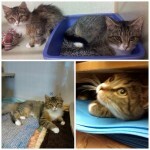 They were Spayed and Neutered by Fixed Fur Life and have now been adopted!